“Bouldering Lake Tahoe-Outlying Areas Edition” is officially done and off to the printer. Copies should be available in June sometime. Yet another very dry month provided numerous perfect climbing days and some good first ascents got done. If this keeps up winter is going to be the new “season” in Tahoe. In the begining of the month Warren Digness, Dave Schwisow, Dave Baxer and I went to this cool boulder I’ve had my eye on for years. It sits majestically on the shoreline of Emerald Bay and it’s only accesable in low water. I wasnt sure if the problems were going to pan out and I questioned if the boulder had enough good features to make fun climbs. To my surprise we put up 11 great lines from vb-v7. They include some juggy warm ups, Two cool v3/4 crimp problems and two v3 arêtes. I came back the next day with Dave Griffith and we did two harder lines. “Siren Song” v6 starts in a seam and does a big move to a hard to find edge and Dgriff pulled off a testy slab on razor edges at v7. At The Beavers Lamberto Franco, Roman Yalowitz and Noah Napier found a new face problem on the backside of the Slug boulder. They worked it for several hours until Mike Njoten cruised up, pissed on it second try and called it v5. I guess the boys were botching the beta, because v5 is usually is a warm up for these guys. Just goes to show you that grades dont mean much somtimes…. Jon Thompson on Baby Bunyan V5 at Lake Audrain. Roman Yalowitz on the Yardbird Arête v5 at Lake Audrain. 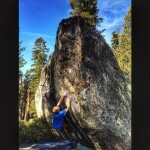 Warren Digness on the new Emerald Bay Beach Boulder. super sporty at the finish. “Yardbird Arete” from Roman Yalowitz climbs a slopey arete to gain a set of crimps about 15 ft up. From there you dyno out right up to a sloper at the apex of the block at around v5 or so. I spent some time with Damion Estrada and Roman Yalowitz checking grades and info at the Clear View Boulders near Tahoe Mountain Road. This section in the guide was fairly close, but needed a few major corrections. On the House of Cards Boulder: “Tombstony” does not go at v5 as it described. It’s a v4 jumpstart to the good hold. The static start is a project and likely at least v9. “Bottom of the Deck” starts higher on the horizontal, not like the description and some unique padding skills are needed to make it fairly safe. “House of Cards” remains unclear because we couldnt do it, it’s for sure not v5, likely v8 or so and not that cool anyways. 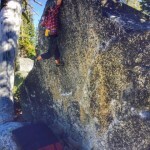 On the Clear View Boulders: “Clear View Crack” is v1, not v3 and would not get 4 stars ever, regardless of the landing. “Horned In” is more like v9 from the sit, not v6 like it’s rated. The stand is around v6. Thats the meat of the corrections, I tuned up many of the descriptions which will be in the 2nd edition of the SE guide. Mike, thanks for your imput. This proves once again how nebulous the grading system can be. I have pulled off some v8 flashes and even a v9 flash and when I did them they felt like v5/6, just like you said about your flashes. I have said before, no mater how hard i work a problem, when I finally send it, it feels like v5. When you finally put it all together of course its going to feel easier. Sending feels easier than falling! And the even funnier thing is I have put in 2 days to do a v4 and had a much easier time on climbs graded much harder. I kinda have rule these days about reaching a “consenses.” If the person flashes it I don’t put much merit in their opinion of the grade, sorry but it was to easy for you to give proper imput. Also, when peolpe downgrade I like to hear several more people agree with them without being coaxed into it. And at the end of the day if you factor in “personal grades,” how you fit, conditions, etc, it gets even more nebulous. I guess somewhere in the middle lies the truth….